Palm Beach, FL — The Screening of Director Joe Berlinger’s Film, “Tony Robbins, I Am Not Your Guru” played to a sold out Palm Beach International Film Festival crowd in Palm Beach, FL. The eager crowd cheered as Robbins arrived to the red carpet. Warm, engaging, and really tall, Robbins stopped to catch up with correspondent Lisa Sussman. “Tony Robbins is a catalyst for change and a strategist for success. He creates change in minutes, when it usually takes years.”- FB. He is author of several New York Times Bestselling Books about Finance and is an advisor to influential minds of today, he also happens to be a really nice guy. 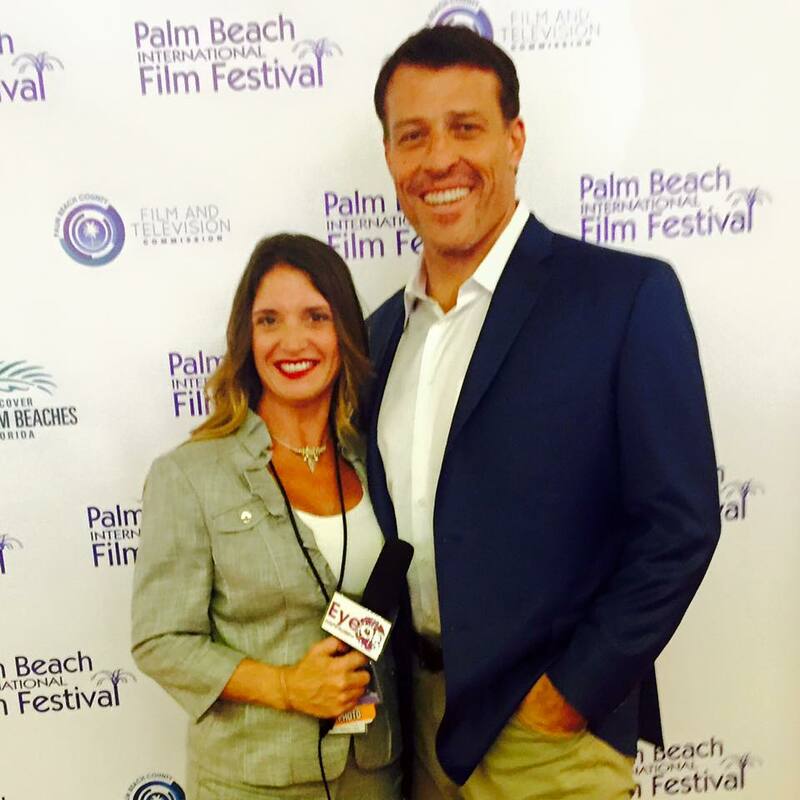 I had a chance to catch up with Tony Robbins on the red carpet prior to the screening of “Tony Robbins, I Am Not Your Guru” . I asked Robbins about this film and how his seminars inspire so many people. Robbins says, “I come back to FL once a year a do a program for 2,000 people which consists of 6 days of total immersion. You have people from all over the world who come. Director Joe Berlinger approached me after attending one of these seminars in FL. Robbins tells how the process was slow due to his hesitation. Robbins says, “Joe Berlinger wanted to make a film, a documentary where he would take 6 days and endless hours of filming and condense into and hour and half, I didn’t think it could be done”. Robbins says, “I resisted for a couple of years, and finally we did it.” Director Joe Berlinger then immersed himself In Robbins home life as well as complete backstage docudrama that plays out to a perfect pitch of joy, pain, rebirth, and awakenings that are relate able by the live audience in the filmed seminars, and those of us watching the movie screening. The interactions between Robbins and his audience creates a community that is grown out of love and support and based in truths. The video that Berlinger captures in the behind the scenes footage of the real hours it takes to assist in this moving, breathing, live dynamic and it is mesmerizing. Tony’s ability to read real life situations is a skilled force to be reckoned with and fans will cheer for his journey. Robbins speaks honestly and from the heart regarding his personal pains and growth. His approachable demeanor feels familiar. He creates a space for truthful interaction where healing begins.